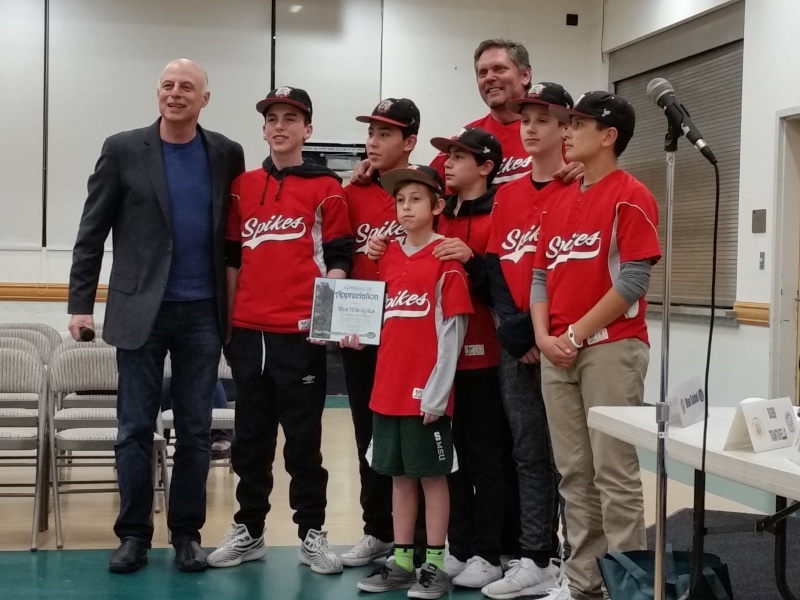 At its Dec. 1 meeting, the West Hills Neighborhood Council presented a Certificate of Appreciation to members of the West Hills Spikes, Westhills Baseball’s traveling 12U team, celebrating their top-10 ranking at the Tournament of Champions in Cooperstown, N.Y. The tournament hosted more than 140 elite teams from across the country. Pictured with WHNC President Dan Brin is coach Rob Burakoff and team members Chase Burakoff, Sam Grunberg, Max Aude, Drew Schore, Troy Littwin and Sam Sonnenberg. This presentation was arranged by WHNC board member Myrl Schreibman, who spoke movingly while introducing the team. Photo by Steve Randall.